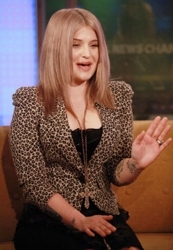 Kelly recently appeared on ‘FOX & Friends’ at FOX Studios on December 6, 2011 in New York City. She created a media buzz with her new haircut styled into a new bob interpretation. Kelly shocked some with her drastic new hair color which has been defined as a cross between blonde and silver or gray. Kelly’s bob hairstyle flowed from a center part. The sides of her haircut appeared tapered and were worn sleek and extending below her chin. Kelly has lost a lot of weight since her days on Dancing With The Stars (DWTS) and her face now appears very slender and oval shaped. Her elongated bob haircut works in harmony with her face shape. The reality TV star’s bob haircut is slightly longer in front, which keeps it from looking too boxy. Darker ends and lighter roots give the haircut a unique edge. Some fans are loving Kelly’s new haircut, hairstyle and color. Others are not as happy with her new look. The good news about Kelly is that she’s constantly changing up her hair cut, hairstyle and color. Since the Red Carpet season is right around the corner it’s a good bet she will change up her hair to honor whatever fashions she showcases. This entry was posted on Monday, December 12th, 2011 at 1:45 pm	and is filed under Hair. You can follow any responses to this entry through the RSS 2.0 feed. Both comments and pings are currently closed.